Urban Athletic Club has created a fully-functional strength and conditioning training gym complete with essentials — treadmills, ellipticals, dumbbells — and the equipment for the fitness connoisseur — squat rack, bumper plates, kettlebells. UAC has several options, including 24/7 access to train on your own, taking a fitness class, joining our regular events, working with a personal trainer, or exploring DC by bike or foot. 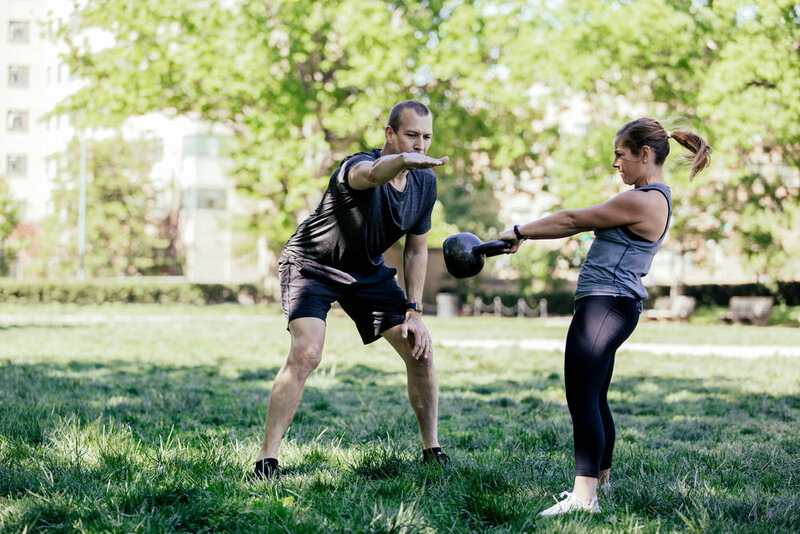 Urban Athletic Club at the LINE DC combines elements of Strength and Conditioning, Cardiovascular Equipment, and Functional Training to provide you the tools necessary to maintain your regular fitness regimen and while trying new things, too! UAC understands that maintaining a fitness routine can be difficult whilst traveling, therefore we've created a gym with all the latest equipment, from TRX suspension training to Olympic Barbells. UAC offers ROGUE barbells (men's and women's), bumper plates, and squat racks. We have hexagon dumbbells from 5 to 50 pounds, and both flat and adjustable benches. UAC offers the latest PRECOR treadmills and ellipticals each with their own flat-screen monitor so you can binge and burn simultaneously. We also offer spin bikes and jump ropes. From TRX training and Kettlebells to Speed Ladders and Plyo Boxes, UAC has gear for you. Work on your core with TRX suspension training, improve your speed on our 40’ custom black turf, or develop explosive power with our full range of Kettlebells. UAC offers yoga mats, blocks, and straps so that you can continue your practice. We also offer a full range of myofascial therapy tools like foam rollers, lacrosse balls, and stability balls. All Running routes start at The LINE Hotel. Routes are created with Strava.com, a free app that tracks your pace, keeps you on route, and allows sharing to Facebook and Instagram! We want you to join us for our regularly-scheduled classes. From our signature Fit Athlete bootcamp-styled class to Urban Yoga, we offer comprehensive and uniques classes to keep you moving. Keep on the lookout for pop-up classes throughout the season! UAC’s signature group training program - Fit Athlete - combines high-powered strength training, metabolic conditioning, and athletic-inspired drills with agility ladders, hurdles, and sleds. These 50-minute classes begin with a whole-body warm-up, transition to skill review, and then go full-throttle with the day’s focus. Classes meet Saturdays at 9:30 am. Email graham@urbanathletic.club to reserve your space. Is there something that just need to have during your stay? Just send me a line at graham@urbanathletic.club or call 202-505-5328. Tour the wonderful and beautiful Potomac River and C&O Canal. There are several boat houses around the Potomac that offer rentals and tours. If you prefer a private tour, please contact me. Whether you're an experienced rider with a Gran Fondo in your history or a casual rider who prefers a chill group ride (a la DC Bike Party), we can point you in the right direction and provide equipment, maps, and other gear. UAC can offer you and your group a private ride. Please contact me if you're interested. There are two recreation centers within walking distance of the LINE. Marie Reed and Banneker within walking distance from The LINE Hotel. Both recreation centers have tennis courts, basketball courts, and pools. UAC has tennis racquets and basketballs for The LINE guests. Tennis balls are available at the Hotel Front Desk for $5. For those tennis enthusiasts who wish to meet with a Tennis Pro, please contact me.